Ding ding ding! 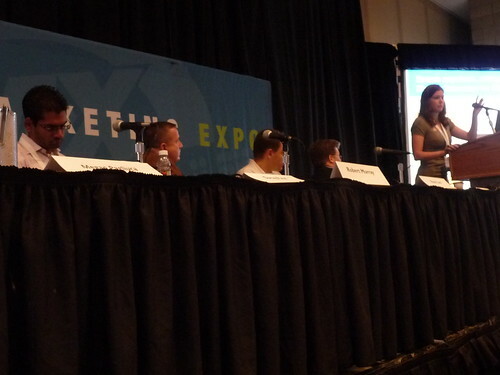 Welcome to round 3, er, day 3 of SMX East! How about some search and display synergy for breakfast? Megan Pagliuca, Director, Professional Services, Yahoo! Inc.
There’s a trend toward search and away from display, Greg says. Though about half of the people in the room are using both, according to a show of hands. Surag Patel is going to talk about a whitepaper called “Whither the Click”, a study on display ads and the synergy between search and display. It was based on 200+ campaigns across the Web. The data in this study was passively measured — no surveys involved. Results from 138 comScore campaign effectiveness study found what happened after a consumer saw a display ad. A week after seeing an ad, about 3.5 percent of consumers went to the site, vs. 2.1 average. Over a four week period, the number continually lifts gradually to 6.6 percent vs. 4.5 percent. It was across the board, no matter the vertical. Display ads don’t just increase site visitation. They also drive consumers to search for the advertiser trademark terms. When measuring the percent of ad viewers who do a trademark or brand search after being exposed to a display ad, there’s a 52 percent lift over the control group. Consumers don’t only increase searches of trademark terms, but also generic product terms like “free shipping,” “hybrid,” etc. After four weeks of the first exposure to the display ad, there was a 42 percent lift when compared to the control group. The Halo effect is also true of search behaviors after seeing a display ad. Not only are consumers who see display ads searching for the brands they see, they’re also searching for comparable brands. Breaking down results by exposure type shows clear synergies. Those searching for a brand are more likely to convert and also have a higher conversion rate when exposed to display, and even higher when exposed to both search and display ads. For multi-channel retailers, the higher reach of display ads often helps lift total offline sales more than does search. But synergy gains can be obtained by using display overlaid on a search campaign. 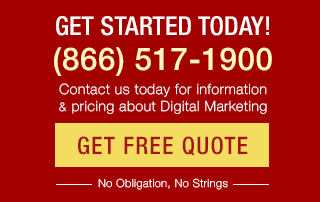 The overall number of people reached by display ads is typically much higher than search. However, since the greatest impacts are seen by those exposed to both search and display, the greatest overall sales impacts are driven by the relatively small group of consumers who see both search and display ads. Finally, don’t forget the importance of the creative — match the messaging or retarget for greatest synergy. Display campaigns aren’t just about clicks; they’re about driving additional searches for your brand and long-tail terms. Objectives were to uncover extent to which Internet users perform searches after exposure to online display ads and to reveal if opportunity exists to leverage search to capture demand created by display. There were 1600 respondents and the survey occurred in January 2009. The data shows that almost as many Internet users initially respond to online display ads by launching a search on a search engine as those who click on the ad itself. The implication is a symbiotic relationship between search and display. And search is an alternative mechanism to respond to display. If you’re investing in online display, leverage search to help capture the demand it creates. Consider search a form of insurance. What’s driving this? Internet users are still unsure about clicking on an ad and where it might lead them. They don’t trust the ad unit or want to accept cookies. And search has become so mainstream that many people use it as their main doorway to the Internet. Internet users are looking for third-party validation of a brand from the search engines. These findings also speak to the need for attribution modeling. Finally, 38 percent of those polled said they were exposed to a brand for the first time through exposure to a display ad. Even better, 14 percent said that not only did they learn about the brand for the first time, but they also ended up purchasing a product. Display is still a viable channel for brand awareness. Marketers can leverage display to push users to a purchase decision sooner. Next up is Kevin Lee. The reality is that, out of the gate, the display budget may not be enough to make an impact. So what kind of tonnage does this take to make an impact? If you’re just dabbling in display, he thinks the best way to go about display is through search retargeting. Where does search targeting end? Ad networks and ad exchanges can follow searchers around. Media drives search. Are you a smaller spender than your competition? Monitor their online media buying and consider piggy-backing on their buzz. To do retargeting there need to be cookies on the consumers’ machines. Whose cookie pool should you use? He likes to start retargeting only on your own site visitors. That way they probably saw your landing page and may have spent some time on your site. You know where the data came from. Success at the retargeting level of your existing visitors forms a foundation. How does it work? A visitor on your site will get a cookie. Later, the company can serve that visitor an ad. Exchange Inventory usually can deliver very well placed ads. Auction-based media is exploding. There are many technologies and ad exchanges, and you have to decide which inventory is best based on your own due diligence. Don’t fall for the “performance deal.” Sometimes you’re paying for the same lead/order multiple ties. Siloed data collection systems can kill you. Use a vendor that really shows you the interaction between search and display. A recent comScore study showed that only 16 percent of Internet users generate all the display ad clicks. 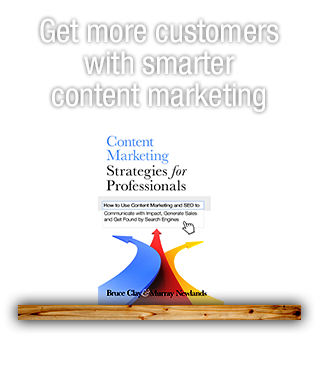 And 8 percent of the users generate 85 percent of clicks. Consider viewthroughs (even Google has it now). Bidding in search auctions can be painful. 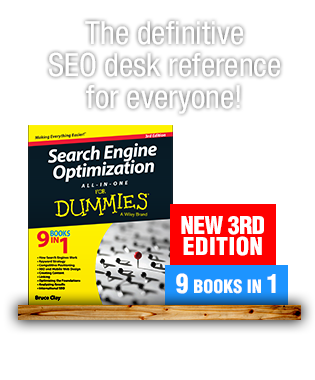 There are only two kinds of marketers at the top of the PPC search results and winning display media auctions — the brilliant marketers and the dummies. There are less searchers than in prior years for many industry segments. Experiment wisely, eliminate the waste in your campaign, and cherry pick the best clicks and impressions. Megan Pagliuca steps up to the podium and asks if there’s any skepticism in the audience regarding the impact of search plus display. One guy says that it’s very complicated and raises some good points. She says that it is something we’re still figuring out. If we agree that display and search are more powerful together, she’s going to talk about executing it. Search assist reporting is a huge gap in the market. Google came out with a product today, Yahoo! has one. This helps for more than just improved attribution. Without cross-channel intelligence, media planners risk undervaluation of upper funnel tactics like display, as well as missed synergies between channels. 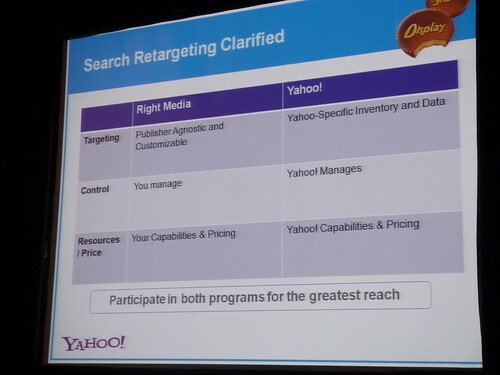 Search retargeting on Yahoo! occurs when a consumer conducts a search using one of the targeting keywords. The results have been incredible. The technology also allows you to use your own data to retarget users. Greg: What are some simple things people can do to get into this complex space? Robert: You’re not going to solve this the first time. It’s going to take continual refinement. Kevin: If anyone’s going to be able to simplify it, it will be the search engines and their self-service platforms. But at least try to launch into it and get started.